A few days ago I posted a piece with lots of lemons. 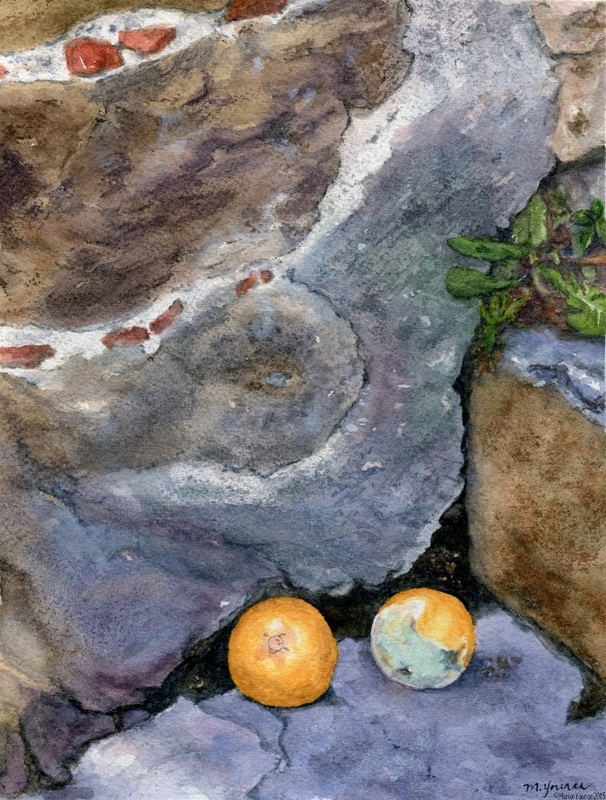 Today I’m posting a watercolour painting of oranges. It would seem I’m in my Citrus Period! This painting is from a photo I took this past spring on a drawing excursion to Arezzo, Italy. It’s such a beautiful city and I was snapping away at all the incredible architecture. When we had stopped to look at another amazing building, I saw this blur of orange out of the corner of my eye and turned to see these 2 oranges stranded in the corner of a stone staircase beside another ancient building wall. Oranges are not cheap commodities at markets here, so it was weird to see them sitting there. However one was very moldy and likely the other was on its way. They looked so out of place. And yet against all the various rock, they also looked very luminous. Took the photo with a painting in mind. At my Monday watercolour class, I pulled out this photo as my subject and dug in. This was going to be a challenge because I haven’t been comfortable painting rock – and there were 3 distinctive types of rock in this photo. My teacher suggested I try some different techniques to get the variety of rock textures, and I’m so glad she did. I took out some spare paper and experimented before I went to the actual painting. I sponged on paint. I dragged paint on the edge of a palette knife (not so easy with watercolour). I did lots of dry brush and finger blending. I applied cling wrap on wet areas (this video helped me). And gradually, I found the techniques that seemed to produce rock-looking effects. Holding my breath a bit, I applied them to my painting and the rocks started to look like rocks, as well as take on their own characteristics. Then there was the painting of the moldy orange. I played around with ways to paint it on spare paper, too. I decided to paint it in 2 sections (healthy orange/moldy orange) separated by leaving white space between them. After the painting, I sponged on some white gouache to get that fuzzy look of green mold. I really enjoyed the process of making this painting – the experimenting and the application to the real painting. And I’m happy with the result because in a weird way, I felt that I owed it to those forgotten oranges to give them their glory! No more citrus pieces are on the horizon… as yet. Who would have thought mouldy oranges would make an interesting subject – but it does! Lovely composition and colours.